Emily Blunt & Tom Cruise in Edge of Tomorrow. One of the sharpest summer blockbusters in years didn't open. The Bruce Willis caper comedy/vanity project Hudson Hawk lost something like $50 million. I loved it in 1991. I love it still. Writer/producer James Cameron confers with director (and ex-spouse) Kathryn Bigelow on the set of 1995's Strange Days, an ambitious cyberpunk flop. Frank Langella and Brandon Routh in Bryan Singer's too-gentle, too-emo Superman Returns. The ambitious but doomed Alien 3, for which Sigourney Weaver was persuaded to shave her head. The making-of documentary Wreckage and Rage from the Alien Quadrilogy Blu-ray set is better than the film itself. It's always a thrill to be invited back on Pop Culture Happy Hour. I joined Linda, Stephen, and Glen to talk about Edge of Tomorrow -- the best would-be summer blockbuster yet in a year that's already seen several strong ones -- and noble failures. We agreed on the B topic before Edge of Tomorrow opened to less-than-stellar business, despite near-universal acclaim from critics. I hope we didn't jinx it, because this is exactly the kind of shrewd, fresh, self-aware big movie that seems to be perennially in danger of extinction. 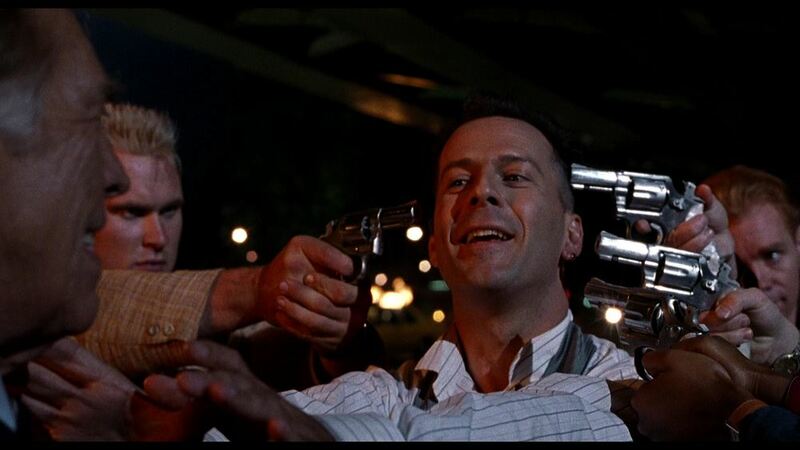 I'd been summoned to PCHH this time at least in part because of my enduring affection for the 1991 caper comedy/Bruce Willis vanity project Hudson Hawk. This is, to my mind, a creatively successful film that also just happened to lose something north of $50 million in 1991 dollars. I always over-prepare when I'm invited on a podcast. I came in ready to talk about a few other movies big genre films whose reach exceeded their grasp: Kathryn Bigelow's ambitious social sci-fi Strange Days, Bryan Singer's way-emo Superman Returns (to which Man of Steel's shrugging, genocidal violence was, I'm convinced, a direct, and stupid, reaction), and Alien 3, the fascinating, troubled sequel that marked David Fincher's feature debut and that he refuses to talk about to this day. Of those three, only Strange Days was a big money-loser like Hudson Hawk was; the other two did okay but fell short of their aesthetic objectives. Anyway, we didn't get to any of those. I'd even jotted down a quote from Roger Ebert's four-star review of Strange Days to read on the air. Having come from a screening of Steve James' wonderful documentary Life Itself -- about Ebert's life, career, illness, and death -- just hours ago as I'm typing this, I'm doubly sorry I didn't get to. We didn't even get to everything I meant to say about Hudson Hawk. Hey, it's a discussion, not a lecture. I'll correct one of those omissions right here: One of Hudson Hawk's villains, Caesar Mario, is a guy who had a chip on his shoulder because he's the lesser-known brother of a more famous gangster. This character is played by Frank Stallone. That's a good casting joke, there. Recorded but cut for time was an acknowledgment -- initiated, would you believe, not by me but by my Pal-for-Life Glen -- about Edge of Tomorrow's homages to ALIENS both large and small, from the armored power suits to the gender-neutral division of action-hero labors between stars Tom Cruise and Emily Blunt, to the presence of Bill Paxton, doing a hilarious 180-degree inversion of Private Hudson, his panicked, "Game over, Man!" Marine from ALIENS. Also cut was my observation that I'm pretty sure this is the first time a live-action summer blockbuster has won the approval of the full PCHH panel in almost four years of this show. The only other one I can remember coming close was J.J. Abrams' Super 8, which only Glen disliked. Listen above or listen here. FURTHER READING: I wrote about Edge of Tomorrow and blockbuster fatigue, and about PG-13 vs. R-rated cine-violence, and about how seeing ALIENS on VHS 400 times as a kid set up expectations that the 2012 ALIEN prequel Prometheus could not possibly satisfy. Strange We Can Believe In: The Totalitarians and Kwaidan, reviewed.